A Bob's Life: National Monument or Park? Quite a bit it turns out. I learned something this morning that I didn't fully understand before. National Parks are established by Congress. National Monuments are established by the President. This was not so clear before the current concern about Bears Ears National Monument. The discussion about reducing the size of a National Monument really is a decision left to the President. There are a lot of issues involved. President Obama created Bears Ears National Monument in December 2016, after years of lobbying by five tribes in the region: the Navajo, the Hopi, the Ute Mountain Ute, the Ute Indian Tribe of the Uintah and Ouray Reservation, and the Zuni. It is named for a pair of towering buttes — the Bears Ears — that dominate much of the landscape. 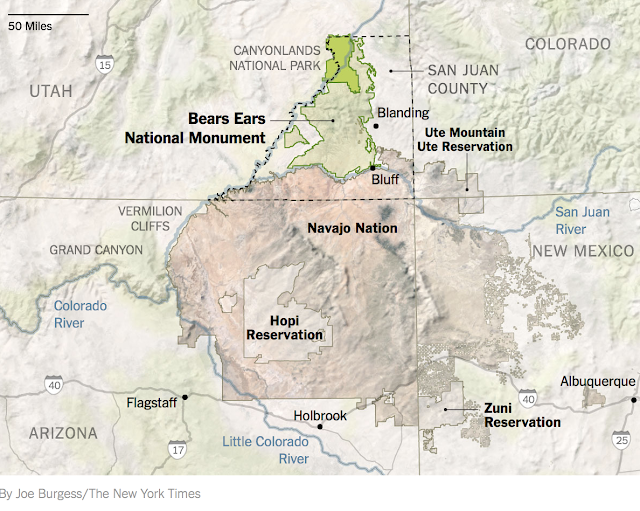 There are a lot of issues surrounding this relatively new National Monument. The good that will come from the current discussion, and through the judicial process, is to determine how far a President can go in determining the relative size of a National Monument. In this case, there apparently are five Native American Tribes also involved in the planning and definition of the monument. Do not misunderstand me here, I am not against National Monuments and land preservation, but some of the writers have suggested that President Obama may have been a bit too generous when establishing the monument using the Antiquities Act. It should make for another interesting day in court.